Region’s construction projects are a sign of economic health. The construction industry is one of the prime factors and drivers of economic growth. It is not an exaggeration to say that significant movement in the construction industry is an indicator of the economic health. And if the amount of new commercial construction projects in Northwest Indiana is any indication, the region is poised for a healthy future. Recovery from the recession of 2007-08 that plagued the area’s economy has resulted in a rebirth and renewed enthusiasm, experts say. 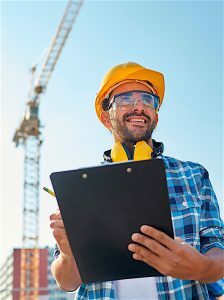 The following is an overview of some of the region’s recently completed or in-progress construction projects and a look at their significance. Holladay Properties spearheaded a 46-acre redevelopment project in LaPorte, targeting retail and medical users. Outlets are being developed to target the larger 20-acre users down to one-acre lots for smaller users. The City of LaPorte Redevelopment Commission is investing $6 million into infrastructure for this development, including a new intersection at Pine Lake Avenue and NewPorte Boulevard. Plans call for pedestrian friendly amenities, including pathways in the development that connect to other pathways throughout the city. Additionally, the development will feature a master drainage plan through a series of bio-swales and landscaping. All infrastructure will be completed by summer of 2016. Chester Inc. is bolstering the local business climate with the Fairway Laser Systems project in Valparaiso, at 950 Transport Drive. The company currently sells the laser systems for engraving to places such as Hoosier Bat Company and Engravables trophy shop in Valparaiso. Plans call for a 4,500-square-foot office and training center with private offices, conference rooms, and large open space for display and training for specialized laser equipment. AN INDUSTRIAL LOOK Chester Inc. is guiding the Fairway Laser Systems project in Valparaiso. Design elements consist of special industrial-look facility with high end architectural flat panel siding and fascia to appeal to their industrial client base. The project is expected to be completed in January. Rich Shields, the company’s director of marketing and development, says this project fits in nicely with Chester’s existing portfolio. They are experts in agricultural systems, architectural and construction, as well as information technologies. Chester recently made an impact in Mishawaka with the Lincolnway Veterinary Clinic project, completed in November. The scope of the project included a 4,400-square-foot neighborhood vet facility with four new exam rooms, fully equipped treatment area, and dual table surgery room specializing in orthopedics for animals. Design elements consist of masonry, siding by HardiePlank to blend in with the neighborhood and fully landscaped parking lot accommodating 32 vehicles. According to Shields, this project enhances the neighborhood, as the 70-year building needed some TLC. A South Bend firm is committed to helping make a Purdue campus more appealing with the construction of a new fitness and conference center. The university celebrated a groundbreaking in fall 2014 and the project continues to develop. According to Ziolkowski Construction’s project manager/estimator, Tim Bodley, the project falls under the scope of normal commercial construction–structural steel, masonry, curtainwall glass and glazing, etc. He estimates the project will cost more than $30 million and will be completed by spring 2016. The $33.4 million building will be paid for through $3.7 million in gifts, along with $5 million to be paid from student fees and state support of $24.7 million, according to a statement from the university. For the university this marks the start of a new era. The turning of the first shovels of dirt culminated 10 years of planning. “Many people here today have been personally involved in conceptualizing and shaping the SSAC and have waited a long time to break ground for this important facility,” PNC chancellor, Dr. James B. Dworkin, said in a statement. Bodley echoes the chancellor’s comments, saying the new facility has been long desired and will enhance the quality of life for students. They will be able to enjoy sports and recreation without having to leave campus. LaPorte-based Larson-Danielson Construction was responsible for bringing to fruition the 280,000-square-foot manufacturing plant for Alcoa/Howmet Power and Propulsion in LaPorte. The project, completed in July 2015, is a facility which produces cast parts for commercial aviation engines. 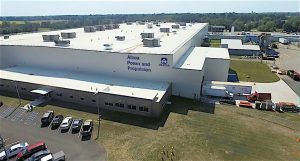 square-foot manufacturing plant for Alcoa/Howmet Power and Propulsion in LaPorte. As is common with manufacturing construction jobs, this project demanded the firm meet specifications regarding both form and function. According to marketing director Terry Larson, manufacturing required a building with a roof height of 45 feet to provide necessary clearances for the manufacturing process and equipment. Also required were three deep pits in the building for equipment. Strict humidity and temperature requirements for the manufacturing process required full height separation walls between the different manufacturing process and high-speed doors to allow access and move materials through the facility. The building has a new LED light system to meet the strict requirements for light levels required to perform the tasks, he adds. As far as timeline, Larson says the project site work began with moving the earth in late July 2014 and concrete foundation work began the first week of August. The owner had a deadline to have the building enclosed by Dec. 1 to allow construction to continue through the winter and meet a completion deadline in the summer of 2015. According to Larson, this development is a step in the right direction for the region and the state as a whole. 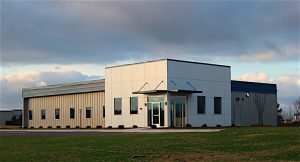 The new Urschel Laboratories World Headquarters in Chesterton, completed in December 2014, was a win for Michigan City-based firm Tonn and Blank. According to Tonn and Blank President Jon Gilmore, this project builds on a longstanding relationship. “For more than half a century, Tonn and Blank has partnered with Urschel Laboratories on dozens of building and renovation projects. We were excited to be selected to be the design builder for this landmark project for the Urschel family,” he says. 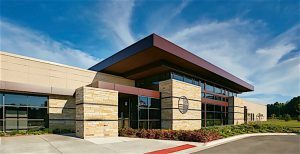 A FOCUS ON SUSTAINABILITY Tonn and Blank was the choice to build the new Urschel Laboratories World Headquarters in Chesterton. The 373,000-square-foot, state-of-the-art facility cost $80 million and took 16 months to complete. 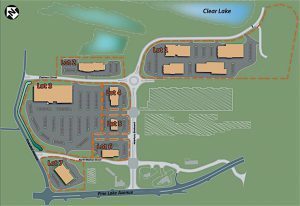 The building sits on 160 acres located within the 640-acre mixed-use development within Coffee Creek, which allows for future growth and expansion. The replacement facility includes new corporate offices and replacement manufacturing facilities. The corporate offices include executive, finance, engineering, sales, manufacturing, test kitchen, studio, IT departments, a museum of the company’s products and other miscellaneous departments. The manufacturing facilities includes a no-bake foundry, investment foundry, heat treating and knife making departments, punch press, vertical, wet and horizontal grinding, lathe, milling, drilling, tool and experimental, sheet metal, assembly, warehousing, shipping, maintenance and other departments, as well as required support facilities. A key hallmark of the construction was its focus on sustainability. In fact the project exceeded energy efficiency requirements. Efficient use of both natural and artificial light, energy-efficient appliances, as well as white roof covering to reduce heat absorption. Bicycle racks and future plans for walking and bike trails point to the firm’s eco-friendly values. DRIVER OF ECONOMIC GROWTH Significant movement in the construction industry suggests that the region is poised for a healthy future. It appears Northwest Indiana has bounced back and is back on the map in terms of economic growth. The commercial real estate sector–especially office, retail, health care and warehouse buildings–is projected to remain robust in 2016 and into 2017. Experts say the region is attracting more interest because of a few factors: Northwest Indiana is a low-cost, high-value location that has no inventory tax, and the property tax is capped at 3 percent.